Get immediate access to this exclusive audio episode! Don’t panic if you got a cryptic Patreon message from us. Chalk it up to a Patreon message fail, but yeah, there’s something interesting in the future for you patrons. Well… two things, actually. One of interest for everyone, and one of interest for those of you who’ve been supporting us for two years or more, because you really rock! 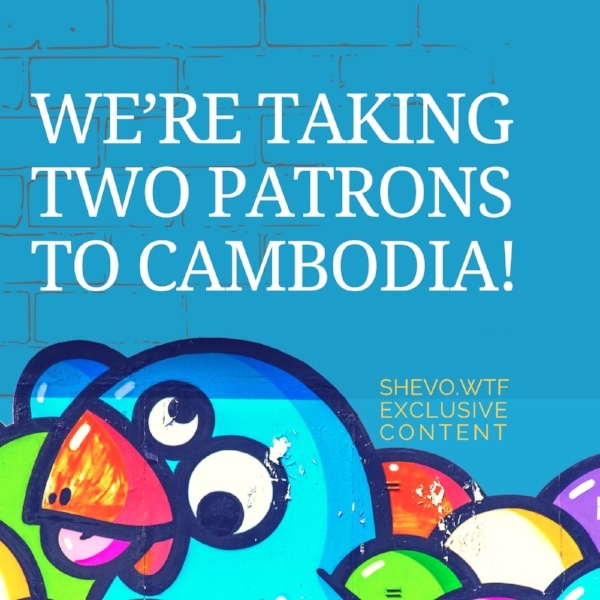 And speaking of patrons… we’re taking a couple of them to Cambodia in just a few short weeks! No, there wasn’t a contest that you missed. Instead, a couple of fine patrons are coming to SE Asia in a few weeks, and we’re tagging along with them to visit Siem Reap and Phnom Penh. It’s a beautiful place with a torrible or herrible history. Those two seemingly typos will make a lot more sense when you listen to this bonus episode, patron. Wait, you’re not already a patron? Get immediate access to this and the other 11 exclusive episodes we’ve released by become our Patron today. It’s cheap!